This module is based loosely on the WordPress Hana Code Insert plugin. A Hanna code tag looks like [hello_world]. A Hanna code tag with attributes looks like [hello_world foo="bar" bar="foo"] using HTML style attributes or [hello_world foo=bar, bar=foo] using ProcessWire selector style attributes. After installing the module, you define your Hanna codes in Setup > Hanna Code. Please see the Hanna Code project page for full instructions. There are major security implications with a tool that will let you enter unfiltered text and code from your web browser. As a result, Hanna codes are meant for definition only by superusers and we recommend keeping it that way. 4. Now to go Setup > Fields and locate the Textarea field(s) that you want to use Hanna codes with ("body" for instance). 5. When editing the field, click the "details" tab, and select "Hanna Code" as the Textformatter. Save. 6. Now go to Setup > Hanna Code and start defining your Hanna Codes! You may want to use one of the examples from this document to get started. Please see the Hanna Code project page for full usage instructions and examples. A Hanna code tag looks like [[hello_world]]. The open and close tags are user definable, [[ and ]] are just the defaults.A Hanna code tag with attributes looks like [[hello_world foo="bar" bar="foo"]] using HTML style attributes or [[hello_world foo=bar, bar=foo]] using ProcessWire selector style attributes. After installing the module, you define yourHanna codes in Setup > Hanna Code. Now to go Setup > Fields and locate the Textarea field(s) that you want to use Hanna codes with ("body" for instance). When editing the field, click the "details" tab, and select "Hanna Code Text Formatter" as the Textformatter. Save. Now go to Setup > Hanna Code and start defining your Hanna Codes! You may want to use one of the examples from this document to get started. Below is a Hanna code tag named hello_world with no attributes. If you pasted this into your body copy, you would getwhatever the replacement value is that you defined. Below is the same Hanna code tag as above, but with attributes more like ProcessWire selectors. You can use whateverformat you prefer. Just note that unlike regular ProcessWire selectors, quotes (single or double) are required around any value that has whitespace. Please make sure that you have completed the How to install section first. Then in your admin, go to Setup > Hanna Codes. 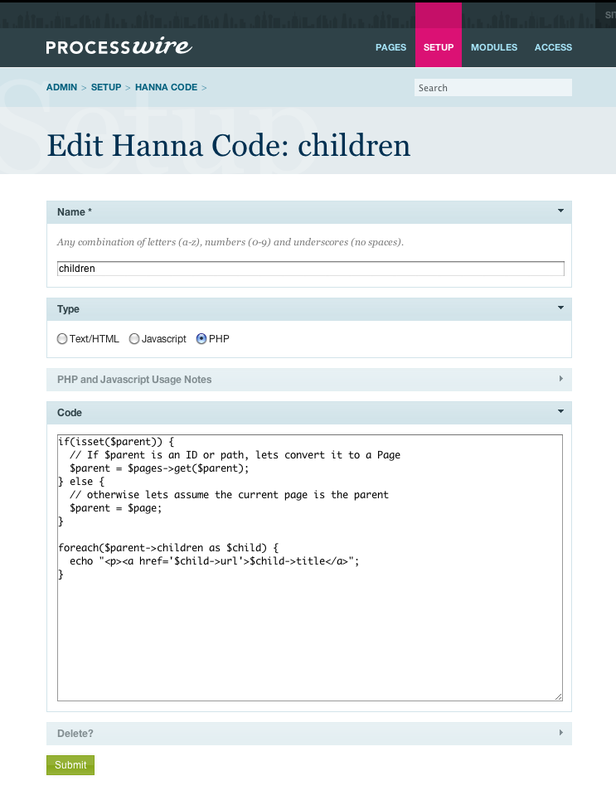 Create a new Hanna code with the name "children". Select "PHP" as the type. Now go and edit a page that has children. In the body copy, enter [[children]] in the place where you want the output to appear. View the page, and you should see the rendered list of links to children. Go back and edit the page where you previously inserted the [[children]] tag, and change it to: [[children, parent=1]] (specifying the homepage) or [[children, parent=/path/to/some/parent/]] if you want to try something else. View the page and you should now see it showing the children of the homepage (or of another parent you specified). There are major security implications with a tool that will let you enter unfiltered text and code from your web browser.As a result, Hanna codes are meant for definition only by superusers and we recommend keeping it that way. Your code should echo or print the value you want to appear as the replacement for the tag. It is not necessary to begin or close your statement with open/close PHP tags. Though you may use them when/if necessary. Your code is executed the same way as a ProcessWire template file and all API variables are locally scoped.Meaning, you can call upon $page, $pages, or any other API variables. directly. See also the PHP Properties section. 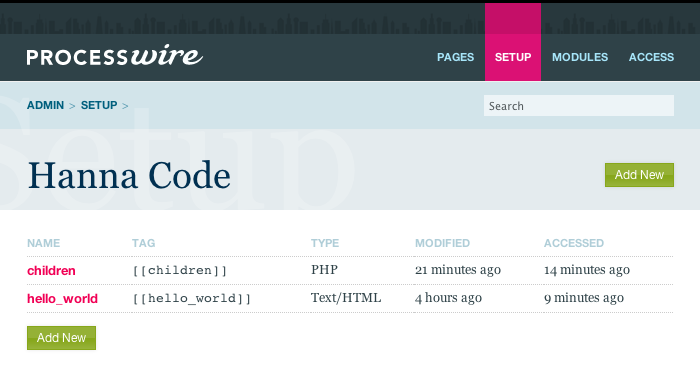 If attributes are specified in the tag, they will appear as locally scoped variables to your PHP code.For instance, in the tag [[hello_world first_name=Karena]], your code will have a $first_name variable populated with 'Karena'.To check for the presence of these attributes, use isset($first_name); for example. All attributes are also populated to an $attr array of [key=value]. For example: $attr['first_name'] == 'Karena',in case you find this syntax preferable, or necessary. If you use an attribute name that is the same as an API variable name (example: $page) then the API variable overrides the attribute name.In that case, the attribute value will only be accessible through $attr (example: $attr['page']). Your code receives an object named $hanna. This can be used for getting additional properties, or modifying the larger text value if necessary.See details in the PHP Properties section. The $page API variable available to your Hanna code represents the page where the Hanna code exists.It is possible for this to be different from wire('page'), which represents the page that originated the request. These code snippets are written to /site/assets/cache/HannaCode/[tag-name].php and directly executed rather than eval(d). An array of [key=value] attributes passed to your Hanna code. The page where the Hanna code exists. The name (string) of the current Hanna code. The Field object representing the text. The larger text where the Hanna code lives. This property may also be set. Please note that "name" is a reserved word and may not be used as an attribute name. It is not necessary to include script tags in your code unless you want to. They will be automatically inserted when not already present. All attributes are also populated to an attr object of attr.key=value (i.e. attr.first_name == 'Karena'), in case you find this syntax preferable. If using attributes, it is recommended that you define defaults in the Attributes field in the Hanna Code editor (even if blank is the default value). Note that name is a reserved word and may not be used as an attribute name. This Hanna code is meant to be used in your body copy. It collects all the headline tags in the text and turns them into anchor jump links while outputtinga linked table of contents. It will put the table of contents wherever you type the Hanna code. [[jumplinks]] Locates all h2 and h3 headlines, turns them into anchors, and generates a table of contents. This is the default behavior with no attributes. [[jumplinks for=h2]] Here we specify a 'for' attribute. It produces the same behavior as above except only anchors h2 headlines. [[jumplinks for="h2 h4"]] Same as above except only anchors h2 and h4 headlines.